This chocolate playdough recipe can be used to create the PERFECT playdough activity for toddlers and preschoolers. 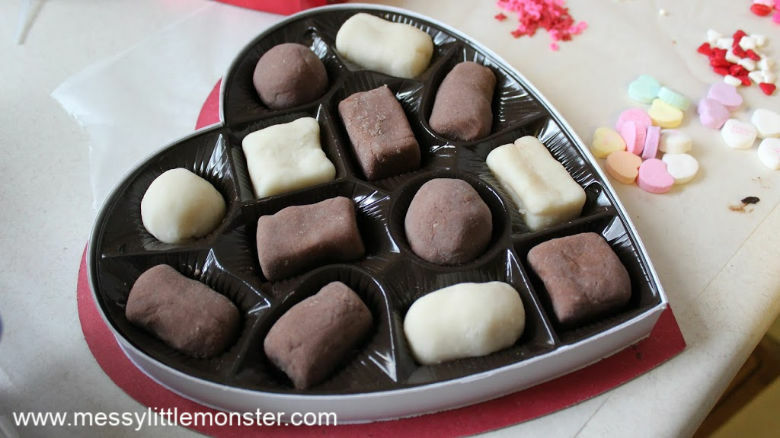 Kids will have a blast making chocolate playdough and then turning their playdough into a box of chocolates that looks good enough to eat! Below are easy step by step directions to show you how to make chocolate playdough! For even more playdough recipes be sure to check out this edible playdough, our cupcake playdough, or even this rainbow playdough! The chocolate playdough recipe we are sharing today would be perfect for a toddler playdate, in the classroom, or as a quiet afternoon activity. 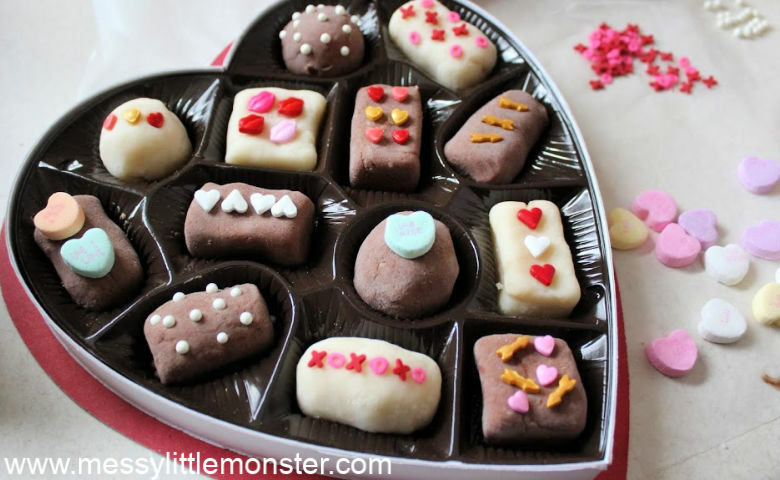 Little ones will have SO MUCH FUN learning how to make chocolate playdough - then shaping and decorating it into a box of chocolates. Toddlers and preschoolers will love getting creative with sprinkles as they decorate their chocolate playdough! Just scroll down for the full chocolate playdough recipe. Before you get started, gather up all the ingredients and supplies. 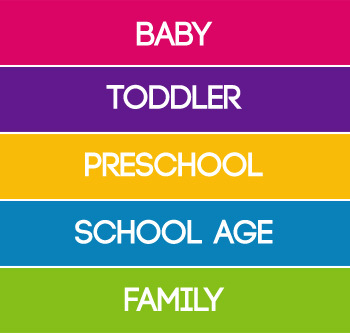 If you are inviting toddlers and preschoolers to help make their own chocolate playdough it may be easier to measure out the correct amount of each ingredient and have it ready for them. This chocolate playdough is made in a pan over the heat, but young children will love helping to add and mix ingredients in the pan before it is heated. 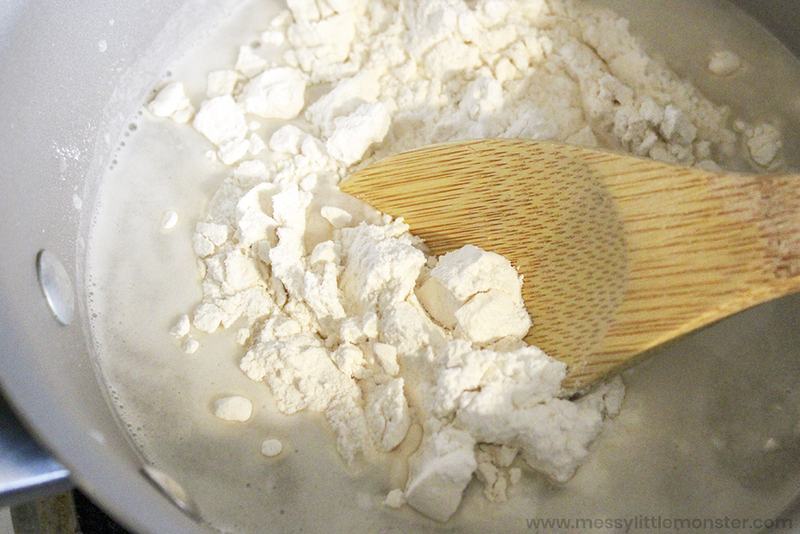 To get started, mix the flour, salt, and cream of tartar in a bowl. Then, add the water and vegetable oil; mix well. 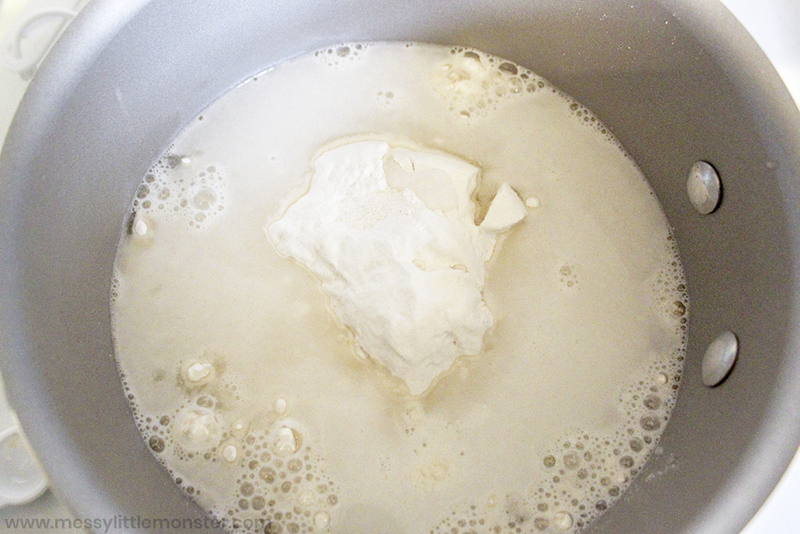 Optionally, divide into two batches - one for white chocolate playdough and one for milk chocolate playdough. But if you're big chocolate fans you might just want to make it all into chocolate playdough! 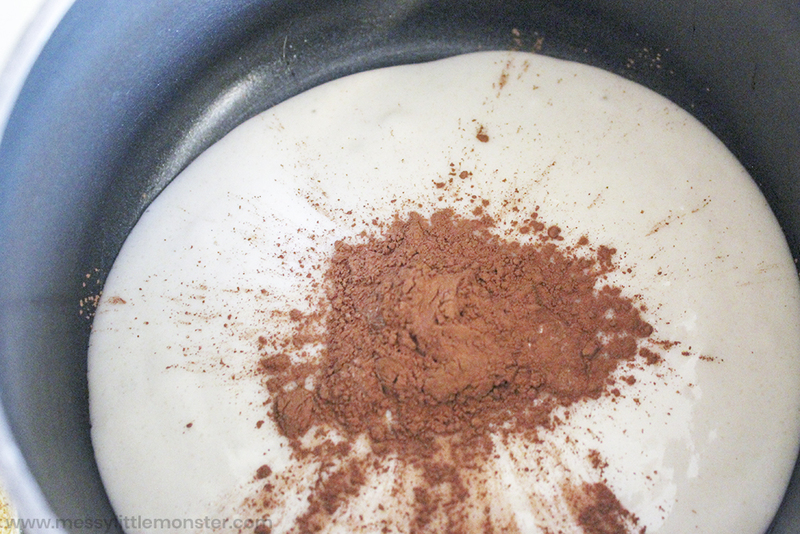 Add the cocoa powder to the chocolate playdough batch and mix well. For each batch, pour the mix into a saucepan and set to low medium heat. Stir until the playdough forms and then turn onto a piece of wax paper to cool. Repeat for both batches. STEP 4: Play and decorate! 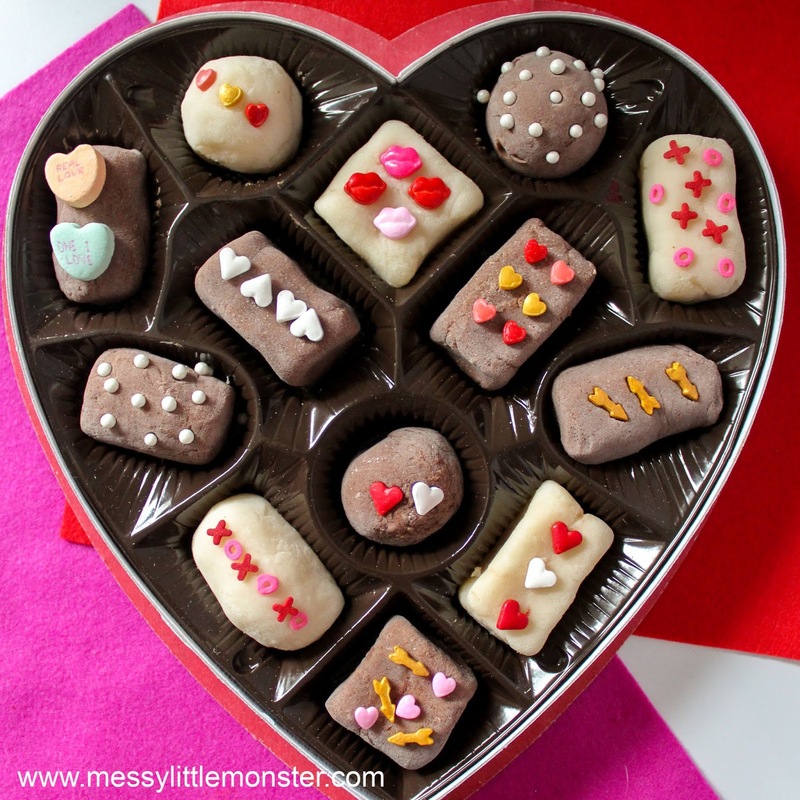 Once your chocolate playdough has cooled set up small dishes with sprinkles and candies and hand your toddler or preschooler an empty box of chocolates container. Help little ones shape the dough into chocolates and decorate with the sprinkles and candies. Have fun and enjoy!! Toddlers and preschoolers will have LOADS of fun with this chocolate playdough. 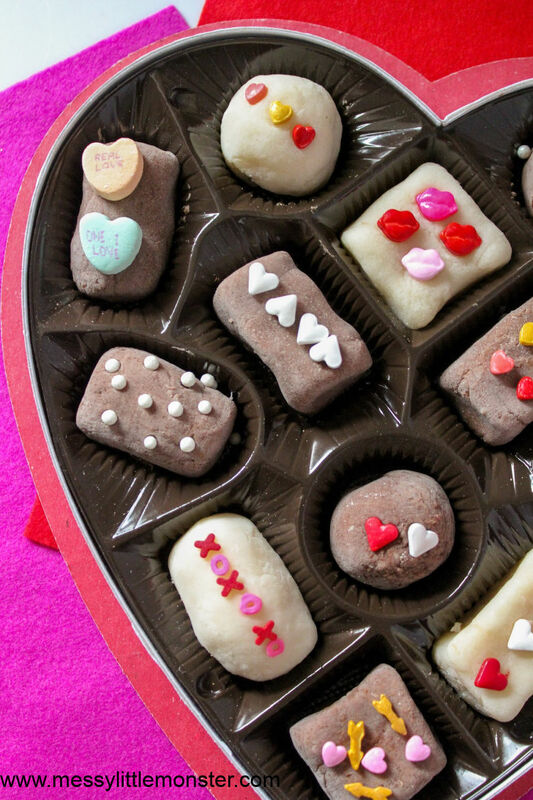 Filling a box with homemade playdough chocolates makes the perfect Valentine's Day activity (especially if you can find a heart shaped chocolate box). Let the kids go crazy shaping chocolates and decorating them. It will be sure to keep them busy for a while! 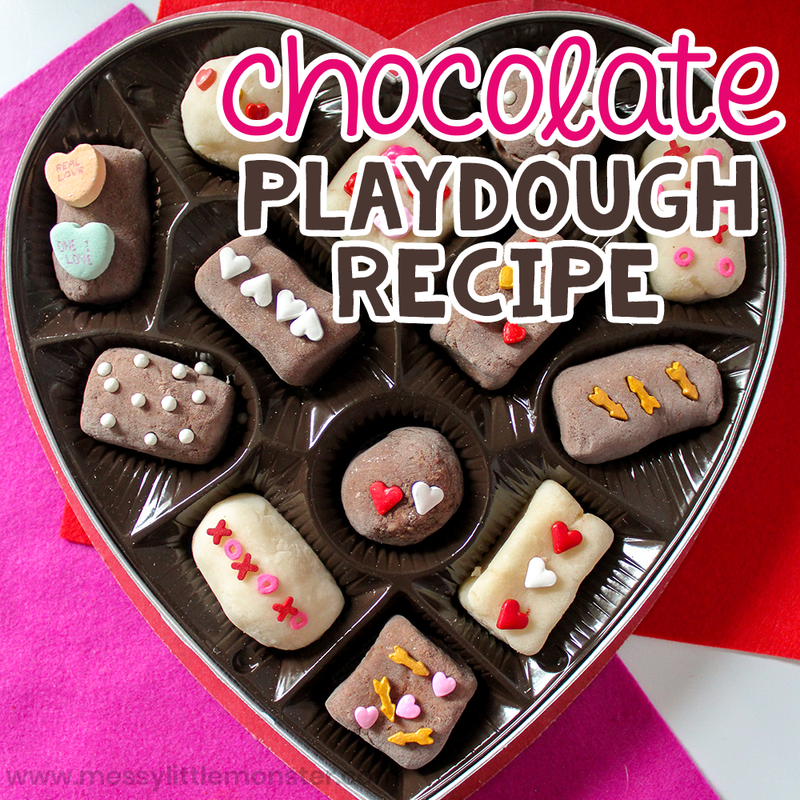 You could even set up a little chocolate shop full of your playdough chocolates for toddlers and preschoolers that enjoy pretend play. 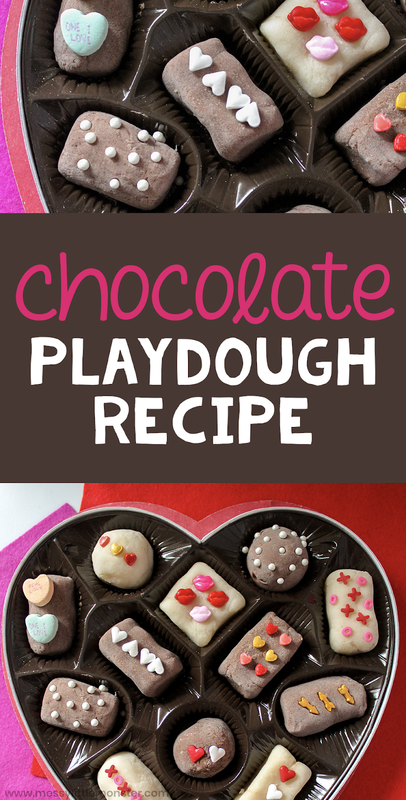 We hope your little ones enjoy having fun making boxes of chocolate with this chocolate playdough recipe!